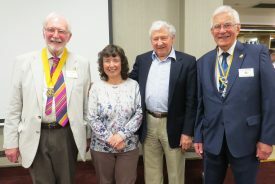 Warwick Rotarians welcomed Professor Harvey Nichols from University of Colorado – Boulder, Colorado, USA, to their evening meeting this week. He is a friend of next year’s President Professor David Smith, and is a campaigner concerned about environmental radioactive pollution in Colorado. Prof Nichols told Rotarians about pollution emanating from the Rocky Flats nuclear weapons production facility, now closed. The site was in use from 1952 to 1992 under the control of the US Department of Energy, during which time there were numerous leaks to air and groundwater. Following conviction of the operators for criminal violation of environmental law, it has been decommissioned and is destined to be a national wildlife refuge. In the audience were representatives of the Chernobyl Children’s Project who bring children living in Belarus to the UK for a holiday each year to aid their remission from cancers still widespread 32 years after the disaster there. They agreed with Prof. Nichols that monitoring of the incidence of cancers by the state is inadequate everywhere, and that huge harm can be caused lasting for generations of any exposure to the levels of pollution described.